The Maggini Quartet are renowned for their educational work, which covers a variety of areas including schools work, chamber music coaching at all levels and work with orchestras. They have several long-running residencies and affiliations, and are committed to encouraging new musicians and audiences to share their enthusiasm for chamber music. The Quartet’s international activities have included coaching at Oberlin and Yale in the USA. Since 1997 they have made annual summer visits to Norway for a fortnight of chamber music coaching and concerts hosted by the Norwegian Chamber Music Society, Norway’s foremost chamber music organisation. In the UK the Maggini are one of the leading ensembles working in the educational field. During their eight years as visiting quartet to the University of Southampton they undertook string and chamber music teaching as well as coaching the University orchestra. 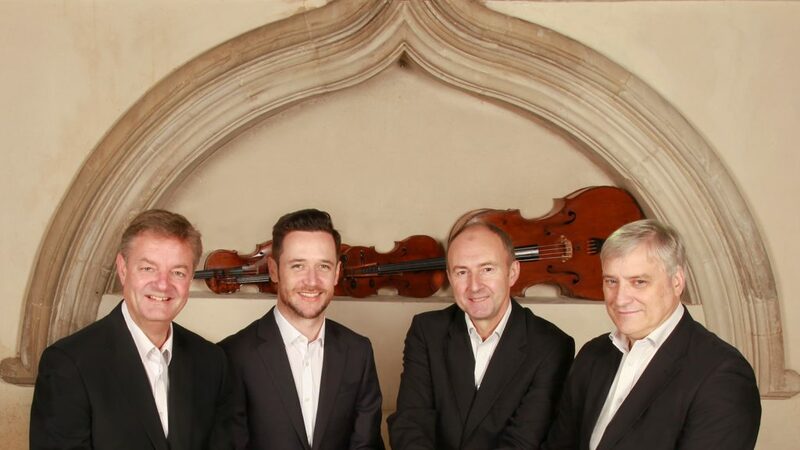 They were appointed Quartet in Residence at Canterbury Christ Church University in 1994, and in January 2004 this fruitful 10-year collaboration with the Music Department was marked by the award of Honorary Fellowships. Since 1995 their affiliation with Brunel University, Uxbridge, has led to a variety of performance and teaching projects and they were awarded Honorary Fellowship in November 2004. Members of the Maggini Quartet have coached chamber music at the Royal Academy of Music, the Royal College of Music, and Trinity College of Music, London, and worked with the National Youth Chamber Orchestra of Great Britain. They have also given individual masterclasses in their own instruments at Birmingham Conservatoire, the Royal Academy of Music, Trinity College of Music, schools in Bedfordshire and Cambridgeshire and Redbridge Music Centre. 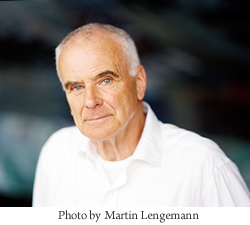 The Maggini’s unique project with Sir Peter Maxwell Davies, performing and recording his ten Naxos Quartets also fed into their educational activities, providing opportunities for additional collaboration with Canterbury Christ Church University, which hosted open rehearsals of all the works and has compiled a major archive covering the whole of this five-year project. The Maggini have also worked with the Wigmore Education Department on schools activities linked to their Wigmore Hall performances of the Naxos Quartets. The Maggini Quartet’s chamber music courses are a long-standing feature of their schedule, and immensely popular. Their involvement with Oxford Chamber Music Weekends dates back to 1984 and they now run four courses annually. They have coached at Chamber Music Weekends for Benslow Music since 1992, and their courses at Brunel have always been popular. Other annual courses include Wellington College, Berkshire. They took part in the Charterhouse Summer School for ten years, and have held chamber music weekends at Birmingham Conservatoire. 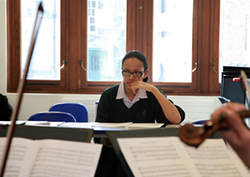 A new annual course has now been established at Watford School of Music. The first event, in November 2018, was very well received. The Maggini Quartet have a serious commitment to working with children, not only as a way of ‘spreading the word’ about chamber music, but also to experience the excitement of the interactive learning process. Concerts and schools workshops have been an important feature of their residencies at Shrewsbury School and Brunel University, and afternoon concerts introducing chamber music form a regular part of their UK tours. 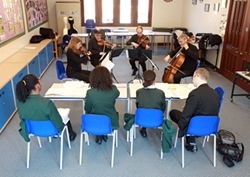 They also coach twice-yearly chamber music courses for schools in Bedfordshire. The Maggini Quartet are delighted with the progress of their exciting and diverse residency at Old Palace of John Whitgift School in Croydon, developed under the dynamic leadership of Director of Music Gareth Hemmings. The range of Maggini activities is very varied, including a series of internal and public concerts and a major dance project in the spring. There has been some really innovative thinking with the Music GCE and A level classes, where we play through and later record the quartet compositions of the students The Maggini Quartet is particularly delighted to develop this way of working, which taps a normally unused part of the abilities of a professional string quartet, and is indebted to Gareth for trailblazing this at Old Palace School. 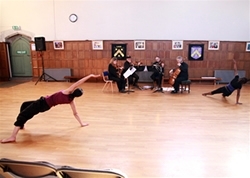 ‘Since 2009 the Maggini Quartet have been closely associated with Old Palace School in our residency programme. This involves regular visits by the Quartet to the school (usually six over the year), and a varied programme is drawn up to ensure that all members of the school benefit from this rich artistic association. There are three strands to this programme; the first is performance. The Quartet will have played to every girl in the school at least once every two years. These performances take the form of an illustrated recital where we dissect the music together to enable a deeper understanding of the music the students are listening to. 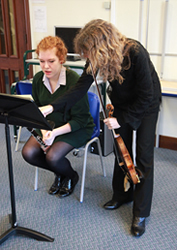 The second strand is creative and allows the girls studying GCSE Music the chance to compose and develop music for String Quartet, which the Magginis will work on with the girls over the course of a term, culminating in a performance. Recent projects have included “Chiaroscuro” (a project collaborating with the Drama Subject Area) and Music for Dancing (a collaboration with the Dance Subject Area). The third strand is coaching. Between them the Quartet have many years of experience as solo and ensemble players, and during the annual residency cycle work closely with musicians from year 3 upwards. This is not just limited to string players but also includes wind players and singers. This allows the student players to work collaboratively, shaping their performance over the space of several months.